http://www.jewishworldreview.com | How should democracies like the U.S. and Israel respond to terrorist attacks that use ambulances loaded with explosives? Terrorists deliberately employ these protected vehicles for two reasons: to fool those whose job it is to prevent acts of terrorism and  the more long-range reason  to provoke the democracies into violating human rights laws by stopping real ambulances and people in medical need. This pattern appears to be spreading. In October, an ambulance was used to blow up a Red Cross headquarters in Iraq. In January, an ambulance blew up a Baghdad hotel. Also in January, a woman feigning injury blew up four Israelis at a checkpoint. In several other instances, ambulances carrying explosives were stopped by Israeli officials before they could do any damage. These ploys exploit the sympathy of decent security guards toward sick civilians. Equally cruel and cynical, the terrorists deliberately seek to increase the suffering of their own people by having them subjected to cumbersome security checks during real medical emergencies. Human rights groups and international organizations play into the terrorists' hands by condemning democracies for violating international law whenever they delay real ambulances. In this so-called cycle of violence, the interference with medical care generates more resentment and more suicide bombings. But in reality, it is anything but an actual cycle. It is a deliberate ploy. The terrorists increase the suffering of their own people and then exploit it to encourage more terrorists and more condemnation of the victims of terrorism. It is a cycle, but it is caused entirely by the calculated actions of the terrorists. Some who sympathize with the terrorists are outraged (or at least pretend outrage) at the suggestion that terrorist leaders would deliberately devise a strategy that subjects their own people  especially sick people and children  to delays and searches. But that is the reality of terrorism. Why then do the democracies fall into this trap? What else could they do but subject all suspicious ambulances, people seeking medical assistance and children to searches? Even when the net is cast narrowly, it will inevitably catch innocent people. 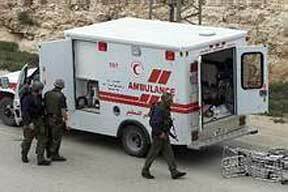 In 2002, the Supreme Court of Israel confronted the issue of how a democracy deals with terrorists who use ambulances and hospitals to facilitate terrorism. It ruled that the Israeli military must abide by the letter of the law, even though it will increase Israel's casualties. Terrorist leaders have exploited this humane ruling and similar ones by American authorities by increasing their use of ambulances. This exploitation will end only when human rights groups focus their criticism on terrorists rather than on democracies that properly stop ambulances that may well contain explosives. Harvard law professor Alan Dershowitz's most recent book is "The Case for Israel." (To purchase, click HERE. Sales help fund JWR.) Comment by clicking here.